The Weston Art Gallery in the Aronoff Center features three works by American installation artist Malcolm Cochran: History Lessons (2011), Requiem (2018), and Washing Feet (1996-97). History Lessons features a looming fixture – a colossal poplar, steel, and polished whitewash stainless steel mirror. The base of the mirrors’ bracket is reminiscent of a sleek vessel, with stems and arms that recall the foil of airplane wings. A bowl-shaped mirror is attached to the bracket base. The mirror’s large, reflective surface illuminates and magnifies the observer’s context. Requiem displays eight pastel-colored refrigerators that are outfitted for singers to sit in with their heads protruding through circular openings, which cut into the upper part of the doors. These small and dated refrigerators, which serve as make-shift caskets, highlight their found-material sources, featuring embossed labels that read “General Electric” and “Eral Electric JE.” Following the opening live vocal performance, the remaining eight speakers play recorded vocal performances. Finally, Washing Feet is a split-project video, featuring a marble blocked, foam board and adjacent light stand upon which two separate videos are projected. The edited footage features images of the heads and feet of the subjects (family, friends, and strangers whose reactions were recorded on two video cameras) as Cochran meticulously and poetically washes their feet, engaging in a ritual practice. These installations facilitate a “gallery literature” while allowing for sculptures to function as metaphors for historical memories. As they consider re-appropriated materials, each intimately connected to Cochran’s life and modern historical moments, his works lend themselves to a historical materialist account. Cochran’s works examine new concepts of history that concomitantly wed present and past histories with subjectivities, at times facilitating a historical or personal excavation, collectively repurposing material dichotomies into a fluid and transformative practice. The framed faces of Cochran’s subjects move between stillness and timorous smiles while Cochran’s staid fingers reverently and ceremonially caress their feet in a basin with a cloth. History Lessons, displayed on the Weston atrium floor, features a rather magnanimous and austere replica of a grand 1955-57 Chevrolet side-view mirror. As curator James Voorhies – who initially commissioned History Lessons for a show -underscores, Cochran’s work allots for a re-examination of relationships between time and affect, presenting future and present conditions regarding ontology collectively in a display of enlargement. The mirror, which Cochran found when emptying his father’s workshop the summer before his death, creates a 16x enlargement. 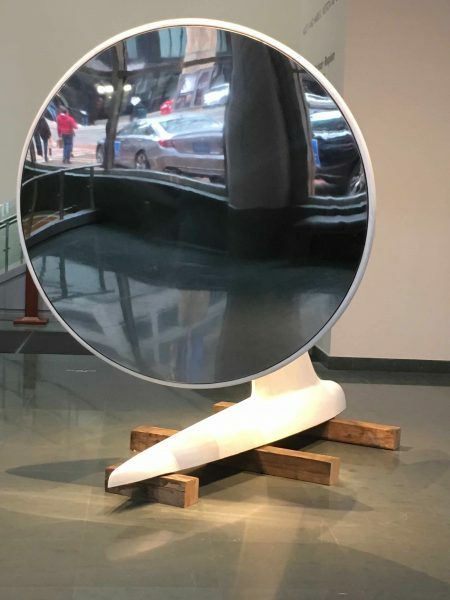 Cochran states that he was drawn to the rearview mirror because of a complex dialogue between form and function, as the mirror’s boxy plastic housing conceals adjustment mechanisms while the gargantuan size undoes any mechanistic utilitarian readings. Cochran was conceptually drawn to the work, examining American patriotism and “this country’s relentless optimism and scant historical memory.” The object proposes, it its enlarged form and magnification, a direct examination of self and framing conditions. Aside from discerning subjectivity alongside socio-economic conditions, such magnification metaphorically considers the subject within a schema of socio-political history. Despite the cantilevered, reflective object that is, History Lessons prods at audiences, asking how to consider social progress and “willful ignorance of history” (Seda-Reeder) in the context of American industrialism, the work also introduces a dialectic materialist survey of the art gallery’s socio-economic condition(s). Made in 2011, History Lessons, which has only been shown once before, subversively explores the relationship between the dialectical image and ideas about the economics of the gallery space, experience, and a materialist presentation of history (a by-product of art history’s institutionalization vis-à-vis the museum or gallery semblance). While History Lessons is not a work that directly implores institutional critique, it effectively addresses the art-historical institution by magnifying audience members alongside their metaphorical and literal bounds, using an American artifact to survey both past disaffected subjects in American history and contemporaneous socio-economic conditions. Entering the downstairs gallery from the atrium, one is confronted with Malcolm Cochran’s newest installation, Requiem. The piece also featured a performance on March 18th, 2018, where the eight refrigerator-caskets were outfitted so that eight female vocalists could sit in them with their heads protruding through circular openings cut in the upper part of the doors. The vocalists performed traditional and classical compositions arranged as solo and a cappella vocals, featuring four songs by contemporary composers. Otherwise, Requiem merges and repurposes the coffin-like discarded refrigerators with vocal performance via recordings of a cappella female voices. The crooning vocals feature four recorded songs, which merge ancient, classical, and contemporary conditions. Requiem’s coffin-refrigerators, much like History Lessons’ mirror, present a survey of immaterial history through dialectic materialist artifacts. The work, as Cochran states, is informed by photographs of hundreds of coffins arranged in rows in a large warehouse holding bodies exhumed from the Srebrenica massacre in Serbia in 1995. The 1995 Srebrenica massacre was a defining moment in post World War II Europe and has facilitated political perspectives on ethnic identity. The slaying of over 7,000 Bosnian Muslim boys and men, perpetrated by Bosnian Serb forces in the eastern town of Srebrenica (Bosnia and Herzegovina) was motivated by President Radovan Karadžić’s instrumentalist identity politics and political entrepreneurship, an ethnic-cleansing directive. As Bosnian Serb military leader Ratko Mladić strolled through Srebrenica, he stated on film recorded by a Serbian journalist that “we give this town to the Serb nation…The time has come to take revenge on the Muslims.” While these specific historical moments are not literally recorded in Requiem, the coffins exude a melancholic interpretation of history. 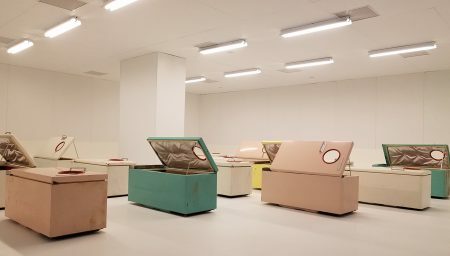 The live performance and eight recorded voices almost forward a liturgical resonance, while the unadorned and sober pastel refrigerator-caskets gesture towards historical commentary, framing ethnocide’s violent past and juxtaposing it with contemporary conditions. When considered within the contemporary political moment of America-centric issues (read: gun violence, police violence on black bodies), Cochran’s institutional critique extends beyond historical analysis and is situated within concurrent violence. Walter Benjamin’s thesis On the Concept of History offers a discussion on a concept of “new history” through historical materialism, imploring a review of present ontological socio-economics via an archeology of material history (Blume). A characteristic of Benjamin’s thesis is that, at the center of it, there is no discursive explanation, but an image instead. As Benjamin’s concept of “new history” transforms concepts into images, it has offered subsequent post-structuralist theorists a mode of assigning signifier-signification relationships that extend beyond a historical condition. By using re-appropriated materials wrought with historical significance, Cochran’s work beseeches Benjamin’s notion of “new history.” Hence, philosophers like Foucault, Derrida, and Ranciere alongside institutional-critique savvy art theorists like Rosalind Krauss and Douglas Crimp have mechanized Benjamin’s thesis to divorce historical events from a linear cause-and-effect relationship, privileging a reading that evaporates historical-philosophical theses from any one “promise of truth.” Cochran’s work does not offer any one “promise of truth as, consequently, all events, together, constitute a progressive, continuous motion. “Now-time” is the crux of Cochran’s two more recent works and their dual-functions. It is for this reason that the final installation, Malcolm Cochran’s Washing Feet – a work from the late nineties – functions as a bit of an outcast oddity when juxtaposed beside History Lessons and Requiem. Washing Feet The multi-channel video-art piece is also a work of installation art. 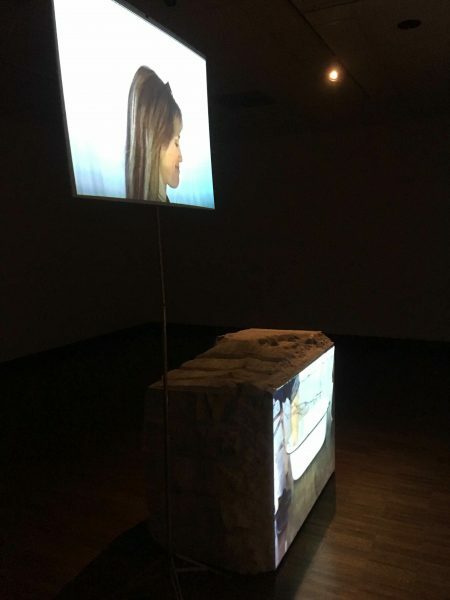 A crass and course large marble block functions as the screen upon which we see projected footage of a cloth, basin, and Cochran’s performance – his hands washing the feet of seven different people, whose faces are displayed on an adjacent light stand. Cochran denotes that at “Heathrow Airport in London I noticed an Indian man having his feet washed by a younger family member. The situation startled me, and the image stuck with me.” This image allowed for his work to develop, as Cochran washed the feet of family, friends, and strangers while recording the images to conduct interwoven case studies. As a resident artist in 1996 at San Francisco’s Headlands Center for the Arts, Cochran facilitated an open house where he washed forty-seven people’s feet, engaging in a ritualistic act. By both projecting the ritual on an uneven and brutish marble block and framing the two-channel installation in an empty square space, Cochran has attempted to convey a sense of public/civic space, testament to the initial moment Cochran observed at Heathrow Airport. History Lessons’ stainless steel mirror was found when Cochran emptied his father’s workshop in the summer following his death; thus, Washing Feet seems Cochran’s most diaristic and personal entry. Certainly, the piece does not engage in an archivist ethos supplemented by socio-political dialectic analysis, which Cochran’s two other featured works offer. Cochran’s Washing Feet does forward the personalistic reflection that his past works such as Song Without Words (for Amy Beach) (1987) expressed. As Song Without Words (for Amy Beach) explored a liminal device between Cochran’s life in New Hampshire and in Ohio, Cochran’s Washing Feet grows from a moment where the artist “…witnessed the most unusual thing during a layover… it startled me, and the image stuck” (Goodson). Washing Feet implores a literal liminal moment between air-travel and, metaphorically, between personal shock and intellectualization. Washing Feet’s ritual serves as Cochran’s intellectualization of a moment of unsettlement, and by washing others’ feet – an otherwise alien task to the artist – Cochran seems to make sense of his bemused confusion. Washing Feet may not aptly consider the same philosophical devices and socio-political concerns that History Lessons and Requiem do, but the work does help contextualize Cochran’s oeuvre. The Weston Gallery presents works of Cochran that evince the transformation of art from humanist individualism towards collective usefulness, galvanized by historical and aesthetic forces. “Collective usefulness,” a term elucidated by Benjamin in describing signifiers of semiotically-based material dichotomies that develop in material-object based culture, includes political re-examinations through archival strategy and the personal ritual. Hence, although Washing Feet is ideationally disjointed from History Lessons and Requiem, all three works reflectively examine collective history or ritual through their subject matter or performance. Blume, H. “For Benjamin: The Theses on the Philosophy of History.” Telos, vol. 1979, no. 41, 1979, pp. 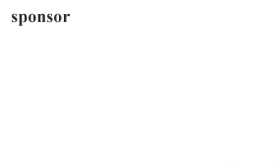 155–157., doi:10.3817/0979041155. Goodson, Michael. “Driven by the Body: A Conversation with Malcolm Cochran.” Sculpture: A Publication of the International Sculpture Center, vol. 36, no. 8, Oct. 2017, pp. 1–6. Seda-Reeder, Maria. “Malcolm Cochran Holds a ‘Requiem’.” CityBeat Cincinnati, CityBeat, 20 Mar. 2018, www.citybeat.com/arts-culture/visual-arts/article/20997236/malcolm-cochran-holds-a-requiem. Voorhies, James. Beyond Objecthood: the Exhibition as a Critical Form since 1968. The MIT Press, 2017.